Earlier this summer my old friend, Suzette, surprised us all and announced she was moving back to her home state of Maine. In the mad dash to get rid of many of her belongings, she offered up for sale a counter display mannequin that she had purchased from Madame Butterfly, a vintage clothing shop on College Avenue in Oakland. Some of my readers might remember that shop, which closed several years ago. As it happens, I had been on the lookout for a mannequin. Something vintage and not too big; something with character but not creepy as mannequins can be. This one is perfect and I love that she hails from I.Magnin & Co., circa 1960s. What a pedigree! I brought my new friend home and placed her in the living room, where she sat bare as can be for over a month. I didn’t know exactly what to do with her but I liked her company … just sitting there, adding a bit of curiosity to my home. What I did know is her name. Suzette, of course. My mother suggested showering Suzette with jewelry so I pondered that for a while and then one day I suddenly knew exactly which pieces. 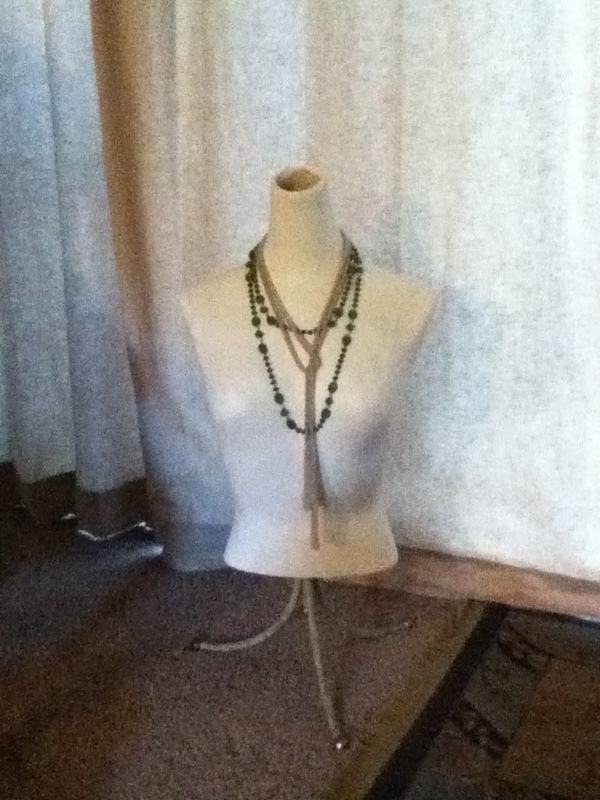 Placed around Suzette’s neck is a strand of 1920s glass scarab beads that I bought at a London antique market. Layered over is a beaded tassel necklace that once belonged to my grandmother. 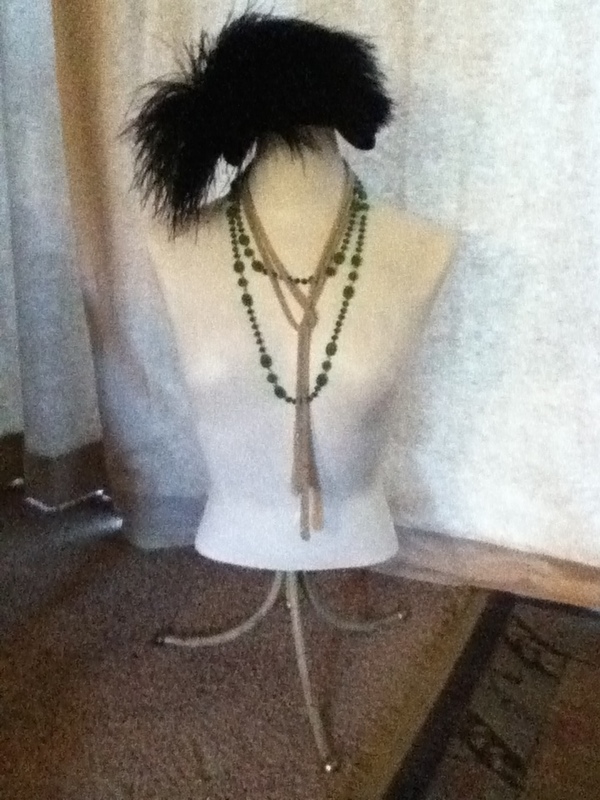 Perched on top of Suzette’s neck is a 1950s velvet hat with added ostrich feathers. Now, doesn’t she look fabulous? crash and burn among designers in the future. 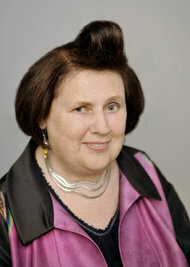 – Suzy Menkes, style editor for the British newspaper The International Herald Tribune. Read more of what Ms. Menkes has to say in her article: Sign of the Times: The New Speed of Fashion in the current issue of T Magazine published by the New York Times. 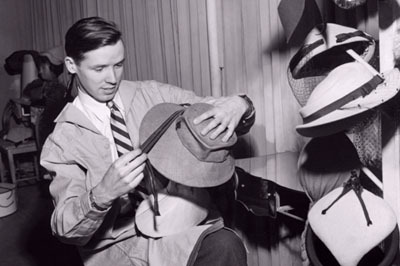 Bill Cunningham fashioning hats in the 1960s. As a kid I went to church and all I did was look at women’s hats. – Bill Cunningham, New York Times fashion photographer and former milliner. Click here to read Mr. Cunningham’s column, On the Street. The Art Deco Society of California is madly (and gladly) planning their 29th annual Gatsby Summer Afternoon set for Sunday, September 8th at the Dunsmuir Hellman Historic Estate located in the Oakland Hills. How are your plans coming along? Got questions? 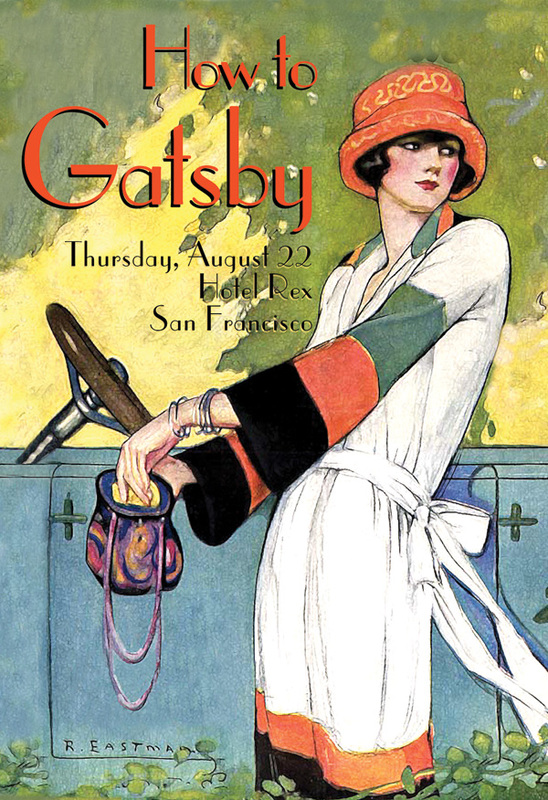 Make a list of your questions and concerns and head on over to the How to Gatsby event Thursday, August 22nd at Hotel Rex in downtown San Francisco. The ADSC will offer tips on: how to create a period appropriate outfit, how to assemble a winning picnic site, and where to find just the right everything you need. Plus, there’s shopping. Starting at 8pm vintage vendors will be selling their wares as well as offering even more tips and advice. It’s a guaranteed evening of Gatsby fun. How to Gatsby is happening on Thursday, August 22nd, 6:30 cocktails, lecture starts at 7pm. Hotel Rex, 562 Sutter Street, SF. Tickets are $10 for members, $15 non-members. We’ll see you there, Old Sport. Style is for the individual, it’s who you are and what you are … fashion makes everyone look alike. 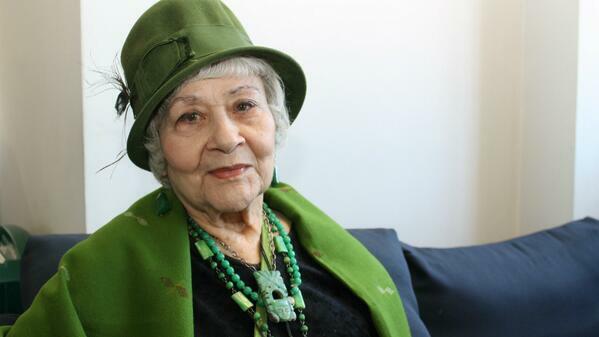 – Blanche Marvin on BBC Radio 4 Woman’s Hour. Ms. Marvin is a London theater critic. In addition to her insightful reviews she is known for her exotic style sense and for sporting themed outfits created especially for each theater production she attends. At the recent Renegade Craft Fair in San Francisco my sis-in-law and I came upon Silvi Alcivar and The Poetry Store. 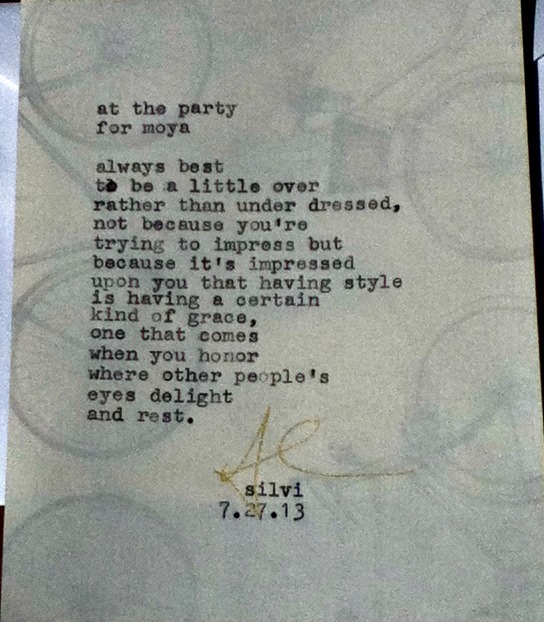 Looking both literary and stylish in black and red, Ms. Alcivar sat nicely at her vintage typewriter creating poems. For a donation of 5 dollars or more (sliding scale) Ms. Alcivar wrote poems in three minutes or less on whatever one asked for. We decided – what fun – and placed our donations on the table. In a mere few minutes I think she really captured the spirit of OverDressed for Life. By the way, Ms. Alcivar is available to write poems for parties, weddings, art/ literary events, and celebrations of all kinds. Bella Freud sweaters for Barbour. Beige and grey are always good colors for me. They make other colors come alive. – Bella Freud, British knitwear designer. Ms. Freud has created a line of cashmere sweaters for Barbour. Her six piece collection includes country critters such as rabbits and sheep depicted in Ms. Freud’s signature whimsical style.